In this tasting we will learn how oak aging influences red wine, with examples from Rioja. 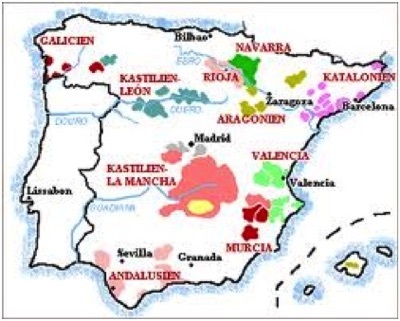 Wines from Rioja come from the Rioja region of northern Spain. The Rioja DOC region is named after the river Oja, a tributary of the Ebro, has its centre in the Ebro Valley and bordered both in the north and south by dramatic mountain ranges, especially the Sierra de Cantabria. Which grapes are allowed in a Rioja wine? Traditionally, red Rioja is a blend of Tempranillo and Garnacha (Spanish for Grenache), sometimes with the addition of Graciano and Mazuelo in small quantities. Tempranillo is the dominant grape variety, not only in Rioja but the whole of Spain, and it matures relatively early and therefore thrives in areas with slightly cooler climate. What quality grade is Rioja? Rioja belongs to the highest grade, DOC - Denominacion de Origen Calificada. For this grade, there are specific requirements for grape varieties, yields, production methods and storage. Which wines should I choose? Choose a Rioja wine from the same producer stored for different periods of time in oak barrels and different vintages, e.g. one Crianza, one Reserva and one or two vintages of Gran Reserva. What is the difference between Crianza, Reserva and Gran Reserva? Unlike the wine regulations of most other countries the Spanish put the emphasis on how long the wine has been stored before it is released for sale. The idea is that the customer should not have to store the wine himself, but the wine should be ready to drink when released on the market. Wines labeled Crianza has been stored for at least 24 months, of which at least 6 months in oak barrels not exceeding 330 litres. Reserva wines are being stored at least 36 months, of which at least 12 months in oak barrels not bigger than 330 litres and Gran reserva requires 60 months of storage, of which at least 18 months in oak barrels. What is meant by vertical tasting? Vertical testing means trying different vintages of the same wine from the same producer and therefore this wine tasting can be said to be vertical. Why store the wine in oak barrels? From the beginning barrels of various woods were used as storage containers for wine instead of e.g. clay jugs. But eventually it was discovered that the wood barrels gave the wine pleasant taste and a longer shelf life. Nowadays barrels of oak are almost exclusively used. The volume of the barrel is of importance to the wine, the bigger the barrel the less contact with the wine and thus less effect of the oak. The most common size is called a barrique holding 225 litres. What happens during aging in oak barrels? Oak is despite its hardness a porous wood and therefore oxygen can penetrate in small amounts and start an oxidation of the wine. The oxygen is a catalyst and it initiates a chemical process, which intensifies the colour by a reaction of the oak tannins with the dyes of the wine. Another effect is that the tannins of the wine become softer. This occurs through a polymerization, so that the wine molecules lump together and form long chains that eventually become so heavy that they settle to the bottom. This makes the wine less astringent and bitter. Why do Rioja wines taste of vanilla? Oak contains three substances that contribute to the character of the wine. These are lactone, lignin and tannin. Lactone gives the wine a coconut character and makes it spicy and aromatic. Lignin is what gives Rioja wine its vanilla character. Different types of oak release different amounts of vanilla. What is the difference between American and French oak? The American white oak has larger pores than the European oak varieties. This means that the American oak releases more vanilla flavour and lactone than the European oak varieties. Where do the toasted tastes come from? When the oak barrels are manufactured the wood planks are heated so that they can be bent and shaped. The inside of the barrel is toasted over an open fire. Different toasting degrees affect oak in different ways. For example the amount of lactone is reduced the more the barrel is toasted, while the vanilla flavour from the lignin increases with toasting, but decreases at really hard toasting. Can you see, smell, taste and feel the influence of oak aging? 1. Compare the colour of the wine in the three or four glasses against a white background. Remember that wines are purple red when young and thereafter the colour turns into ruby red, while brick red is associated with older more mature wines. Storage in oak intensifies the colour. 2. Smell the wine by swirling the glass a few seconds, then sniff. Is the bouquet intense or small? Can you feel any difference between the vintages? Younger wines will have aromas, relating to the grape variety. Such smells are often fruit related, and hence wines are described as smelling of blackcurrants, raspberries, and so on, or maybe simply as 'fruity'. As wines age more aromas develop, which may be more earthy or animalistic and complex. If you smell something reminding of port wine it is often a mature wine. All red Rioja has a characteristic smell of vanilla and sweetness due to the aging in American oak barrels. to enjoy it, and it's probably true to say that such wines are generally of better quality. the lips and on the tip of the tongue? This sensation comes from the tannins. is moderate and varies between 11 % and 13 %.